A 10-bedroom “modern boho open space” in the East Village that runs just $10 a night might seem like a scam to the discerning Airbnb user. But the housing post actually has no strings attached -- for homeless people that is. 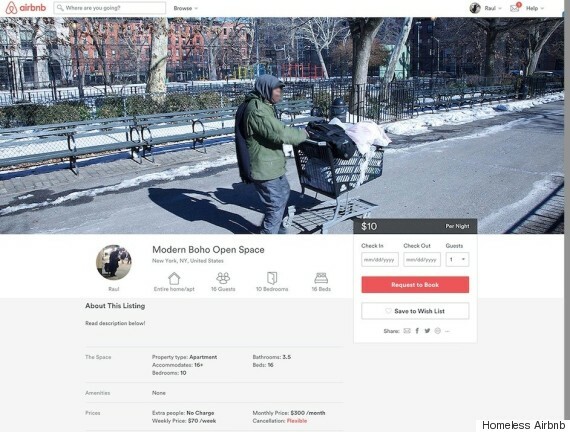 To highlight the economic disparities in some of New York City’s most sought after neighborhoods, and support homeless people in need, two advertising professionals have been flooding the popular home-rental site with posts that show the “accommodations” people on the streets endure. 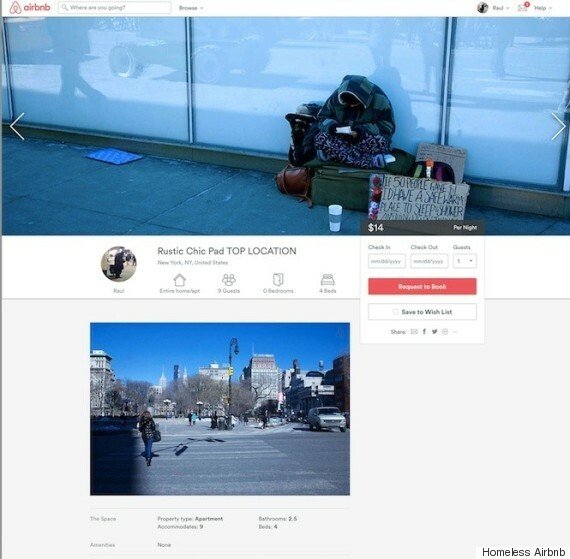 The “Homeless Airbnb” posts, which are scattered across the site, follow the standard format of describing the iconic views, nearby transportation options and eateries. The social-good project comes at a time when the Big Apple is facing record homelessness rates and Airbnb has come under fire its lack of concern for people on the streets. As of mid-December, New York City’s homeless population reached an all-time high of 59,068 people, according to city records. Homeless figures have jumped 10 percent since Mayor Bill de Blasio took office, New York Daily News reported. Shin and Catalani hope the posts will both raise awareness for the city’s homelessness problem and some funds for local organizations helping the vulnerable community. The pair said they’re donating 100 percent of all money collected to such organizations as the New York Rescue Mission and Common Ground. The two are drawing attention to the issue just as Airbnb’s commitment to its platitude of “you can belong anywhere” has come into question. Just outside the company’s gleaming 72,000-square-foot San Francisco headquarters, the Guardian recently counted about 20 homeless people living on the streets. None of the homeless people interviewed knew anything about Airbnb’s sharing economy motto. Airbnb told the Guardian that it's doing its part by supporting the mayor's efforts to launch a new housing center for homeless vets and by exploring ways to use its platform to help people in need. But people on the streets near the headquarters say they often feel invisible. To help homeless people in NYC, consider supporting Robin Hood's Crowdrise campaign through the widget below.